plain circles of track, often looking like they would fit into a pizza box. that have appeared in my Inbox since our last Pizza Parade. 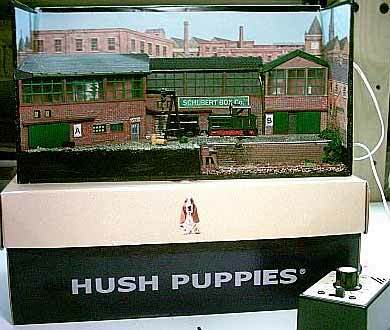 It isn’t often that I see a completely new idea in model railroading. But here’s one! 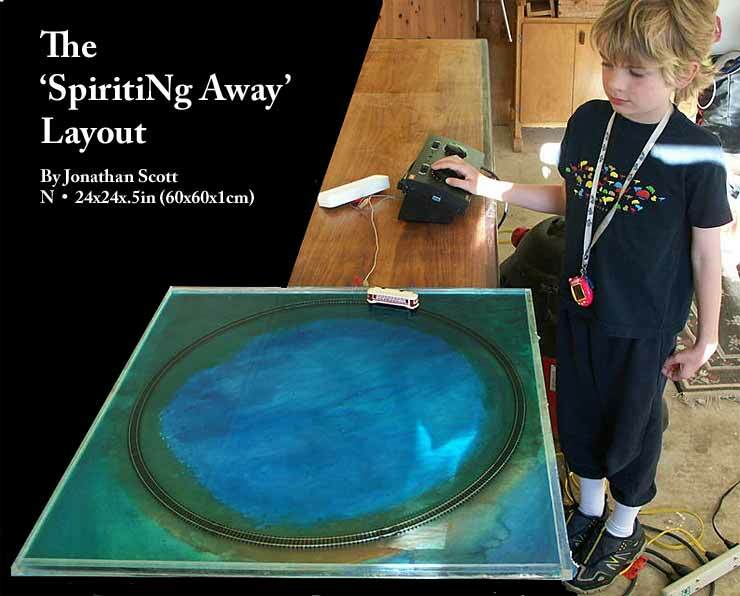 Jonathan Scott, from Hamilton, New Zealand, was inspired by an enchanting scene in Miyazaki’s Oscar-winning anime film “Spirited Away,” where the heroine travels in a train that runs on tracks recently submerged by the rains. 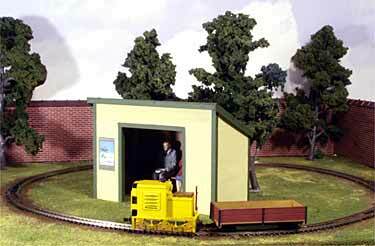 Jonathan combined technical and artistic skills to create this N-scale layout, SpiritiNg Away. In the top photo, young Edwin Scott takes a turn at the controls. The trolley car (tram) magically circles the baseboard, completely submerged up to its axles in distilled water, trailing small waves in its wake. For more delightful photographs and the details of how Jonathan accomplished this magic, see his website. Go ahead. This page will stay here until you return. I think he’s already accompished his main goal! Albert Winkel, from Ter Apel, Holland, built his 2006 Christmas pizza in Gn15 scale on a 45cm (18in) baseboard. 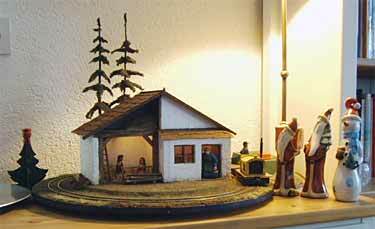 The traditional “stable” decorations came from a German supermarket (Albert lives near the border), but the building and locomotive were both scratchbuilt. Building interiors are completely furnished and illuminated. The handlaid track is soldered to PC board sleepers (crossties). 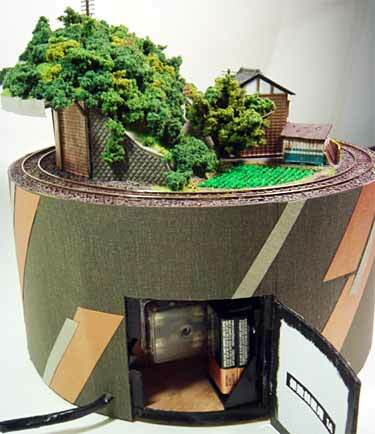 Alan Cox, from Swansea, Wales, built his N-scale holiday pizza on a cardboard disk 35cm (14in) in diameter that came as part of some packaging. 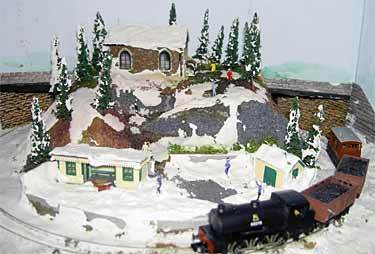 After painting, the landscape was covered with snow by Busch, which is mixed with water and poured on to give the effect of melting snow. For more information, see Alan’s website. 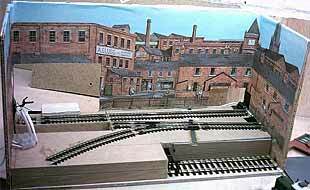 Martin Hogg, from Mansfield, England, built this HOe layout (1:87 scale running on 9mm gauge) as a test loop for narrow-gauge locomotives. 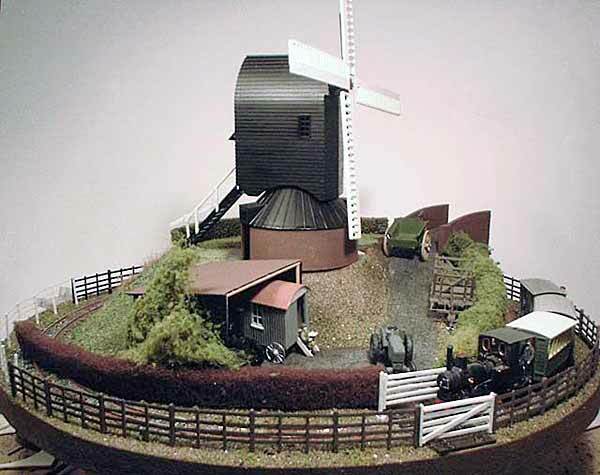 His daughter, Edie, is looking over the bucolic English countryside depicted. To learn more about Martin’s modeling activities, check out his website. Henning Stelter adapted the Foursquare Circles layout in our Micro Layout Design Gallery to fit his home in Hamburg, Germany. 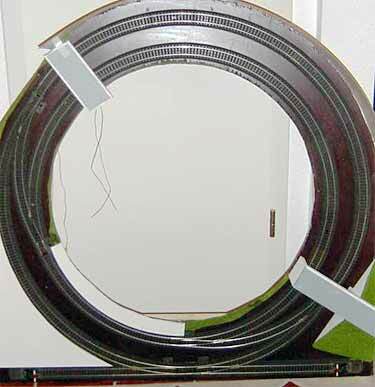 The H0 layout is 95cm (37in) in diameter with a cut out circle measuring 60cm (24in). 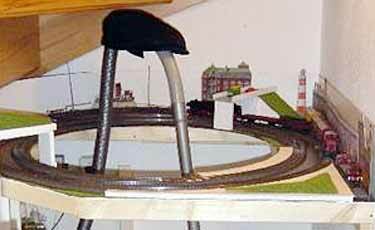 Standard Märklin track is used. The object in the center of the right-hand picture is a vacuum-cleaner hose wearing a cap — it’s a stand-in for the operator who will occupy that space when construction is finished! 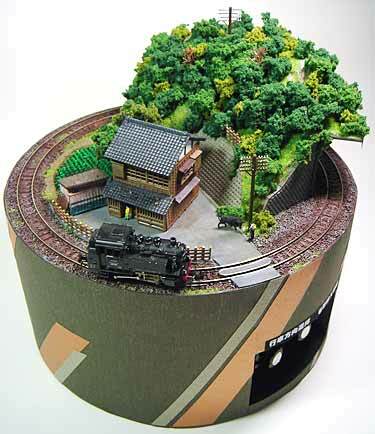 This tiny N scale pizza layout, Circle Dream, was built by Kuo Chang Lu (nicknamed “A-Bao”), who lives in Tao-yuan city, Taiwan. Many thanks go to Jiun Wen Guo, from Taipei, who translated his friend’s work and forwarded photos and layout information. Circle Dream is 23cm (9in) in diameter. A-Bao uses Tomix Fine Track with a radius of 103mm (4in). The operator can directly control the locomotive via an on-board control system, powered by either a 9V battery or 110V AC that the on-board transformer will convert into 12V DC. The water buffalo (center below) is a Preiser cow that A-Bao modified and painted gray! 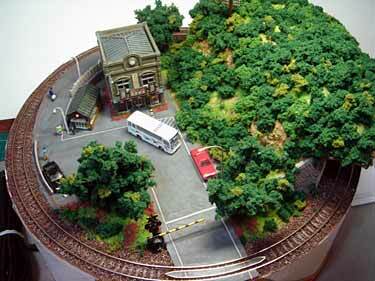 There are more excellent photos of this charming little layout at the Taiwan Trains Society Forum. Jiun Wen also forwarded photos of A-Bao’s newest pizza layout, called Gift. This one is more urban in tone than Circle Dream, but is the same size — 23cm (9in) in diameter and features the same on-board control system. 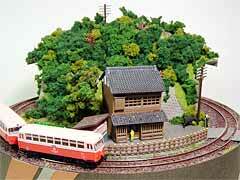 All photos of both layouts were taken by their builder, Kuo Chang Lu. THIS LAYOUT IS BRIMMING WITH FUN! 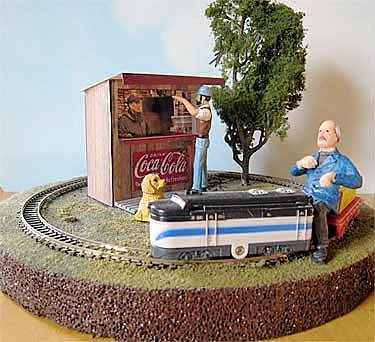 A topping good idea comes from Alan Cox, from Swansea, Wales (his holiday layout is pictured above). 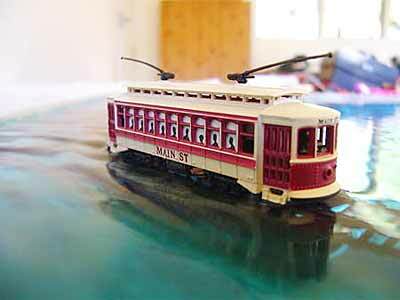 A few years back he also built the Hatterhorn, using Tomix Fine Track and a Modemo tram. 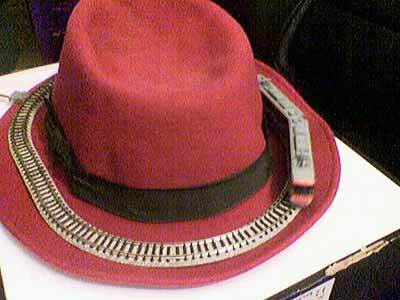 Hats off to Alan for adding valve gear to headgear! 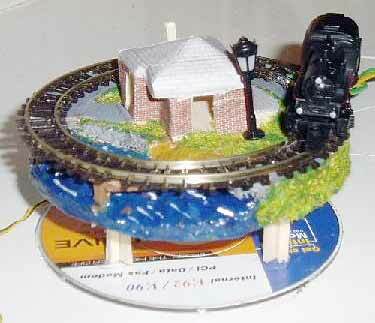 Having successfully built an N scale pizza on a CD disk (see Scrapbook #55), Thomas Carpenter, from Leeds, England, built two more Diskworld layouts. His HO pizza (above) is built on an LP record; his Z pizza (or is it piZZa?) occupies a mini CD disk (just 8cm in diameter!) shown at right. For more details, see his website. Here are two pizzas made as test layouts for a new scale/gauge combination, called Gnine — G scale trains on 9mm tracks, or about a 9in (23cm) gauge in the prototype. At left is a 9in diameter pizza by Carl Arendt (also see Scrapbook #57a). Above right is another quickie, this one by Ian Holmes, from Princeton, Minnesota USA. The baseboard measures 20x20in (50x50cm). Total construction time for each demonstration pike was about two hours (mostly spent waiting for the glue to dry). Ian maintains an excellent web page on Gnine. Joe Lockhart, from Indianapolis, Indiana USA, used materials from many sources to build his Gn15 pizza line, Rusty & Dusty Mining Supply Co. 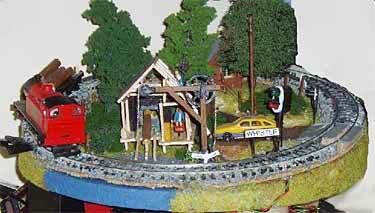 He reports, “The engine was an HO switcher. I removed the shell and added some model car parts. The cars are Thomas the Tank toys with gold nugget loads. 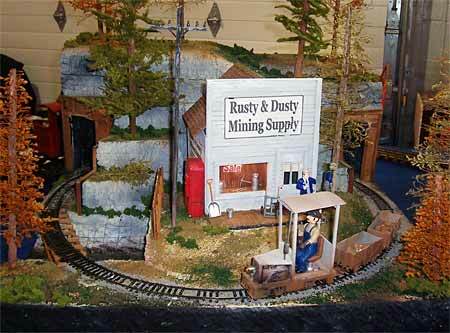 “I found in building small layouts like this you have an opportunity to experience new techniques, such as the trees and my first scratch built building. Note the coke machine, it’s a refrigerator magnet. 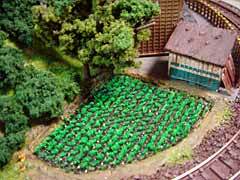 The roof is 50-grit sandpaper, cut into strips and glued onto plastic.” The layout is 24in square (60cm square). PRESENTING … A PERFECT PROTOTYPE PIZZA PIKE! Reader Rodney Hills, from Surrey in the UK, sent information about an actual pizza railway that existed in real life, on a sea-swept rock just off the coast of Angus, Scotland. 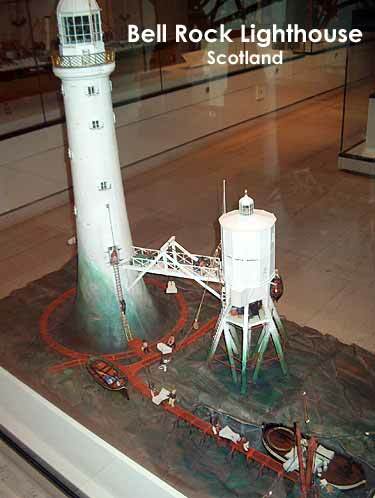 It’s Bell Rock Lighthouse, a 115-foot beacon that has protected shipping since 1811 when construction was completed. A 30-inch tramway was built to aid construction, and parts of it remained in place for hauling supplies from the wharf to the tower.